This is the perfect addition for both parents and educators looking to implement a visual picture schedule for students with special needs! 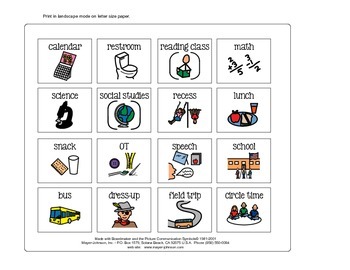 I used these cards in my kindergarten classroom with my students with autism who needed individualized picture schedules. Just print, cut, laminate and velcro and you're ready to go! Included in this PDF is two full color pages with a total of 32 picture schedule cards. If there are any cards that you would like that I didn't include, please message me and let me know! I would be glad to customize this product for you!